Spinoff, Vol XXXVII, No 4, Winter 2014 titled "The Feral Spinner: evolving back to the basics of making yarn, pgs 64-66. YarnMaker, No 25, Winter 2015 titled "My Kind of Spinning" pgs 5-7. This last article contains the most details on how she produces twist on an industrial bobbin. I was pointed at Debbie's book in a class I was teaching on the history and use of the Scottish Dealgan by a student who knew the term "spinning stick" was used in Debbie's book. I purchased Debbie's book and read it from cover to cover, but while the spinning stick was pictured, the book concentrated on gathering fleece to produce socks from 2 ply wool handspun. She sized the 2 ply to match commercial 4 ply sock yarn. But how was she using her spindle/bobbin? So, in the beginning research, I mistakenly 'engineered' a dealgan based on my own studies of the dealgan design. You can find more info in my blog on Scottish Dealgans here: http://missingspindle.blogspot.com/2016/05/spin-like-youre-scottish-plying-on.html and by searching Youtube for 'missingspindle'. 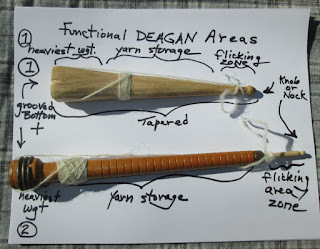 Comparison of a 1700's dealgan to an Industrial Weaving Bobbin, unaltered. b. heaviest area at the bottom-widened bottom on Dealgan, weighted steel rings on Bobbin. c. Grooved cross on bottom for Dealgan; added grooves on Bobbin bottom. 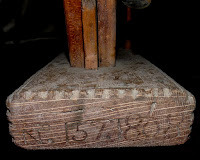 e. Knob or Nock on top-existing on Dealgan; Added on Bobbin with separate dowl press fit into top hole. NOTE: Debbie Z's bobbin had no dowel on top. Four industrial bobbin types, converted to steampunk spindles. Brown: 7 1/4" long, 32.3 grams/1.1 oz. Yellow: 8 5/8" long, 42.8 grams/1.5 oz. Red: 8 3/4" long, 39.5 grams/1.4 oz. Long Tan: 15" long, 78.1 grams/2.8 oz. Wait a Minute: which way was Debbie Z spinning? Suspended or Horizontally as she walked? It took a while to find the two magazine articles (above) that Debbie Z had written. Turns out I was not right about the suspended spindle solution. I and my testers produced very very slow twist when using a suspended bobbin without the dowel on top. The top is too fat to flick and get a goodly amount of twist to draft out. Hence the alteration by dowel to solve that slow twist delivery. 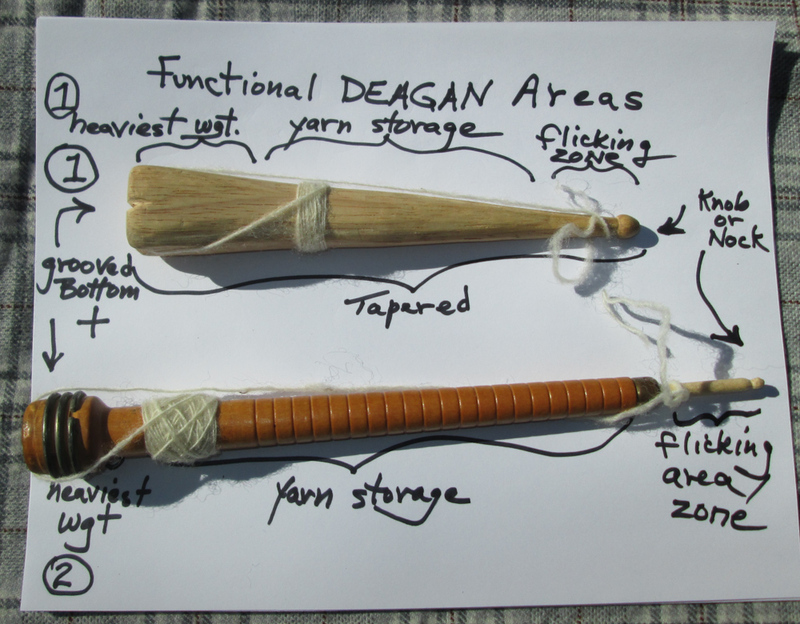 Both mag articles confirm Debbie Z. is spinning horizontally with an unaltered 8" industrial bobbin/pirn. I made a (fuzzy) shoot-it-yourself video of how this horizontal spinning works here. The narrow end of the bobbin rests on the palm. The top end with its steel rings and yarn storage area rotates loosely in the partially open top of the fingers and thumb. It is rotated in the left hand quite loosely. The twist forms from the bottom near the palm and runs horizontally into the fibers held in the right hand. The forming yarn is held with enough tension so it is pulled straight across the body. The twirling motion originates from the wrist. Hard to describe, easy to do. This method, with its slow twist delivery is good for softly twisted yarns, but also supports fine yarn creation, though the insertion of twist is slow. But if you are walking thru the Highlands and Islands of Scotland, you have a lot of time...... And a horizontal spinning stick is a lot less easy to drop and roll off into the sea. 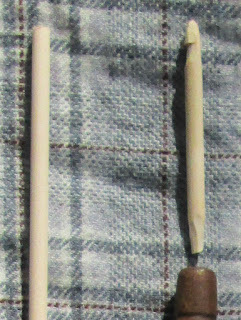 a. cut the 3/16 wood dowel in half lengthwise. c. Press this tapered end into the narrow top of the industrial bobbin until it is 'seated' at least 3/4-1 inch down into the sloppy 1/8" hole on top. Trim the tapered-end dowel to 2 1/2 inches long and press or pound it down in so that 1 1/2" sticks out the top. Sometimes the pounding is done with a hammer. d. Form the top of the dowel sticking out of the bobbin with your utility knife so that it comes to a point. e. About 3/8" from the top point, place the utility knife point horizontally across the dowel and press into the dowel (resting on a firm surface) to form a narrow groove across the grain. f. below this groove, start whittling the knife edge carefully up to the groove to form a flat leading up to the groove. Do this several times carefully. As you get close to the groove, be very slow and carefully so the wood above the groove doesn't chip off. Repeat pressing the knife edge into the groove horizontally and continue to whittle below the groove until it is about 1/2 as deep as the dowel. g. Smooth your work with sandpaper. 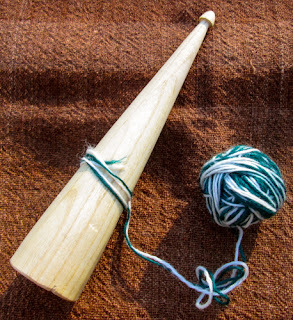 h. Test the dowel nock and correct if the yarn doesn't 'seat' well in your nok. a. 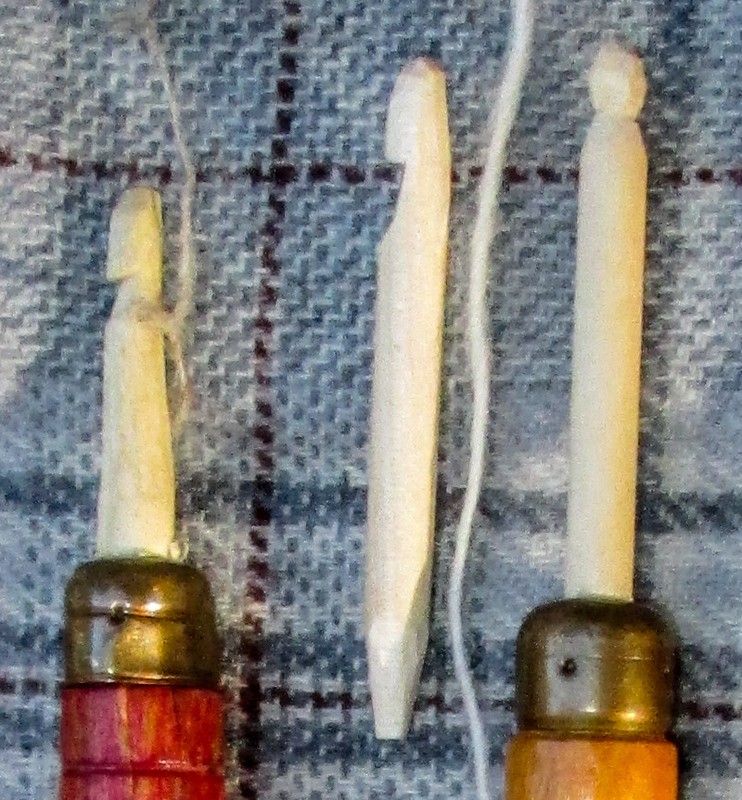 With the triangular file, lightly score two grooves directly opposite each other on the bottom of the bobbin. They should line up. Deepen the grooves until the yarn you are using seats into the grooves easily. b. Form a second pair of grooves at right angles to the first set. c. Carefully lay the triangular file in a straight line above the first groove and file back and forth on the 3 steel rings to form a v-groove. This doesn't have to be very deep. It should facilitate catching the yarn as it is lined up with the bottom grooves. Sand the bottom and steel grooves until they are smooth. d. You are done. Your bobbin should now be a Steampunk Dealgan. (Not historical, but so sturdy, so cheap, so replaceable). "I just bought my first raw Corriedale fleece; it is clean and gorgeous but I have never spun anything with this much grease (NOTE-this fleece is a year old)....Could you tell me if you washed to remove any of the grease before you spun your Corriedale? I was thinking to wash in a little soap but not super hot water, so I don’t loose all the lanolin. I am just not sure about the best way to prep this fleece." Usually the fleece is very freshly shorn and quite clean and free of much weed/muddy/poopy bits. So that means I sort out the best fiber and set it aside (see below). I also plan to spin this very clean fiber within six months before it stiffens up and gets sticky. If the grease is fresh and not sticky, I do spin it without washing and put up with the greasy feel of it on my fingers. It means washing my hands after each session, however. Experience plus: my hands become very soft! Experience plus plus: unspun fleeces kept in plastic bags in hot environments (your car; your attic; next to a hot heater or register, etc) sticky-up a lot faster. And another note on leaving lanolin behind on a sticky fleece: that would be a Nope, too late. NOTE: if you can't spin up your in-the-grease fleece before it gets stiff and sticky, for goodness sake, don't prep the whole thing as tops or rolags in the grease in your optimism. Almost impossible to wash it after that. You'll just have a pile of sticky wool good mainly for felting, not yarn making. If I have to wash a fleece because the grease is stiffening or feels the least bit sticky, I use a top loading washing machine but very very carefully. If you haven't done this before and your fleece was really really expensive (example: you bought it by the OUNCE or paid more than $15 for the whole thing....) then hesitate. You want something like a dubious 'gift fleece' or a "barn run" or "about to go off to the wool pool" type farmer's fleece for your first machine wash experience. WHY not wash it 'by hand' by 'separating the locks; by any other fiddly hand washing method: 1. this method generally keeps the locks intact enough to accurately ID sections of fleece for carding or combing. 2. It takes a lot less messing around so I can spin it. 3. I have a lot of fleeces to get washed and want them washed before winter, when I spin. 4. It doesn't take forever and does a good job. 5. It is less likely to felt a fleece at the cut ends since there is so little agitation when it is most vulnerable in hot water or going from hot to colder water. 1. arrange the fleece lock side up (this can be puzzling, depending on how it was gathered up/wrapped. Try to keep it together in sections, pull it apart by sections if you can. 2. Identify the head, back and back end of the fleece. The back end is usually very very obvious. The back/top of the fleece along the spine often has the most weed seed in it. A. Best (longest length; cleanest; very little weed seed; good tips). Likely to be found next to the back section on the sides. D. Throw it out (heavy dunging, heavy weed seed, second cuts, really short locks, matted locks) DO NOT GIVE THIS AWAY TO A BEGINNING SPINNER. That might go for C. too. Compost or trash it. Be sensible. You aren't going to spin this stuff, not once you lavish love on A and B. 2. It is NOT A WASHING MACHINE, really. It is a tub that holds hot water to soak a fleece in. It is a centrifuge to spin that water out. NO AGITATION. NONE. That means you too. No poking the fleece around in hot water. NONE. 3. Lots of anxiety that using this top loading washing machine for fleece will 'ruin' the washer. I personally have had no 'clogged filter' issues. Of course, I don't pack the tub and the water only fills between 5/8-3/4's of the tub with fleece/water when centrifuging (spinning out the water). I've been using the same washer for 10 years or more. Maytag. Select the two bags of sorted fleece, A and B. Put B in a laundry bag, loosely, if you want it totally separate from the best fleece. (Entering fleece note: I generally put the A. best fleece in first, no bag and the B. less best fleece in a laundry bag loosely. They will go on opposite sides of the tub.) NOTE: if you have a huge fleece (think Corriedale; think 10-12 pounds. Wash A alone. Then wash B alone). The water temp of the washer should be about 130-140 degrees fahrenheit. I add boiling water to reach that temp, if needed. I fill the washer, empty, with that water (NO FLEECE). Then I put in one and a half cups (1 1/2 cups) of dishwashing liquid (Joy or Dawn) and about a cup of white vinegar, mix it around briefly. I add the fleece and push it gently below the water. The fleece that floats on top is pushed down with an old empty laundry detergent bottle until it is just below the water. That's it, no more poking the fleece about. I make sure the washer does NOT turn on to agitate. I let this sit for up to one hour, no agitation at all with the lid closed. Don't leave it until the wash water cools off. Don't leave the house for more than an hour until you have spun out the hot water. Because the sticky lanolin/suint will settle out onto your fleece again as it cools in the water. I move the washer dial to SPIN, about half way to the end of the spin cycle (because some sly washers will squirt sneaky cold water down while spinning-fatal for felting fleece-so move dial to middle or almost the end of the spin cycle). Then I spin out the water. I TAKE the fleece out and DRY it. Completely. Takes patience. Leave it on a rack until really dry. So my process is Soapy Water Wash. DRY IT. Hot Wash Rinse. DRY IT. Label it so you remember you need to rinse it! Then I do the same thing with the hot water and vinegar above WITHOUT the soap for the rinse-out the-soap-cycle. After the fleece is dry the second time, it should be ready to spin. If you decrease the amount of soap in the first cycle, it will leave a lot more lanolin behind. No matter what you do, the sheep grease will stiffen with time ( after a year or more). When it is stiff, repeat the above wash, but you must use 130-140 F hot water for sure. The missingspindle experience has evolved rather rapidly since I began sharing my experimental research on spinning tools of the past in 2014. I began this blog/YouTube video set to explain how medieval spindles work so my students could remember what they learned in class and review it outside of class. This evolved into more historic spinning topics and an Etsy account to put medieval spindles into more spinsters' hands. At first, this was easy. I make my own re-creations of archaeological finds, using both a motored lathe and hand tools, along with 'found' recycled wood and / or green wood. BUT, I didn't anticipate the pressures of so many YouTube views on my 'channel' (recently over 100,000 and not slowing down). I especially didn't anticipate the rich and fascinating history of Scottish spindles and the popularity of the demand for them specifically. This means that my original research plan, nice and tidy, has been waylaid by a side path of great fascination and depth. Which also means that I am putting a lot of energy into the research of the side path, along with following the original research path. During these two research paths, my workshop has become untidy. My book room, computer files, and my home are filled with random piles and in need of re-organization. I also angered a body joint and pulled a leg muscle with too much museum visit enthusiasm. Everything else has ground to a halt while I achieve more orderly surroundings and a happier joint and significant muscle. I am making progress and will be back at the lathe in mid-October. I am running behind on serving the needs of those who want the spindles I research for their own research, demo, & curiosity. I intended to refill my Etsy shop far sooner, but...... My apologies for the delay. This blog is not really keeping up with where I am in my research. I think you will love what is upcoming as I get time to post more about historical spindles and distaves here and on YouTube. The interactions with all of the commenters online, the wonderful in-person meetings with students in classes and encounters after classes is adding a rich layer of understanding of how to teach and, especially, what I taught that 'didn't work'. The history of the Scots before and after their defeat at the Battle of Culloden (1746 CE) fascinates me. Since I am mainly interested in the spinning and weaving lives of women through the centuries, I've been re-creating and spin-testing the unusual whorl-less spindles found in the remote Highlands and Islands of Scotland, as well as those which went to Canada with early Scottish settlers of remote areas in Quebec, Nova Scotia, New Brunswick, Cape Breton, and Prince Edward Island, among others. There is also one 'sighting' in the eastern Appalachians where the Scots-Irish settled. What makes these more important than most historical spindles is that they are the vanishing-technology relics of a culture that was harshly suppressed by the British after the Battle of Culloden, along with their Gaelic language, dress (-think kilts-) and customs. In fact, as I started this study, much of the information about these spindles came from North America, not Scotland itself. Like the Gaelic language, there were more surviving users in North America, where many Scots settled to escape poverty, starvation and even death in their homelands. One sad aspect of my research was that I was about 2 generations too late to find active users of these spindle types. How does the Gaelic whorl-less spindle work? What was it used for? For video instructions go to my YouTube video here. and go thru one side of cross. 4. Spin yarn in opposite direction to singles spin to ply. Wind plied yarn onto dealgan obliquely. What was the Dealgan used for? These plied yarns were used in knitting socks, mittens and hats. Plied and unplied singles yarns were used in weaving. Another source from the 1880's mentions making plied twine for fishing nets (perhaps the spindle for this is spelled 'Persaid'). When examining pictures from the late 1800's-early 1900's it is clear that some Outer Hebrides women are using carded wool rolags to spin singles woolen yarn on elongated whorl-less spindles of the dealgan type. How old is the Dealgan/Farsadh/Fairsaid? The earliest museum-dated Dealgan is found in the Glasgow Museum in Edinburgh. It is recorded as being from the 1700's and was collected on the Isle of Harris in the Outer Hebrides of Scotland. 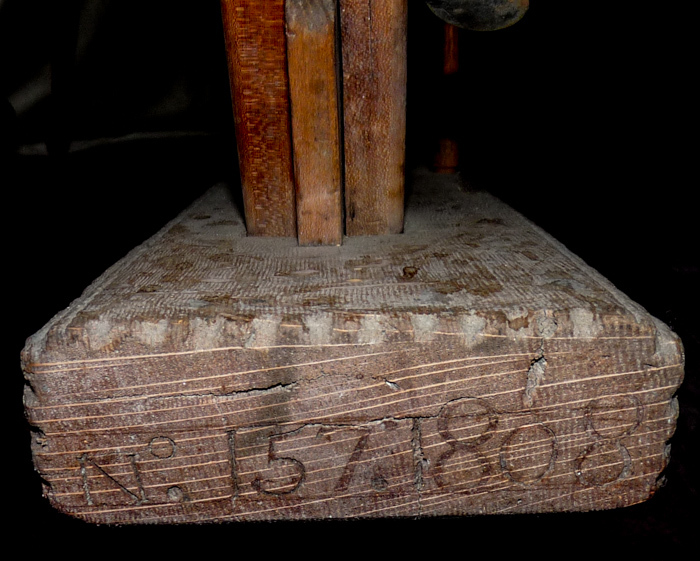 (In my 'Spin like you're Scottish' video, you will see a re-creation of this hand-carved spindle in use.) 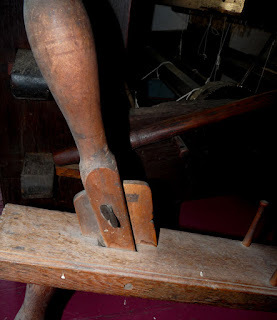 There is a good possibility that this spindle type is much earlier than the 1700's. I suspect the spindle shape could be a much older Gaelic type with few survivors in museums or in archaeological digs. The search goes on for more. Many surviving dealgans were made from memory in the 1900s or are simply undateable vintage or antique examples. Yarn cop in the form of a obliquely wound ball. 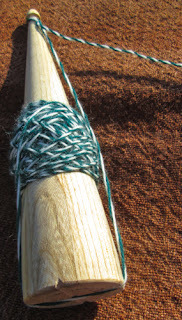 This spindle shape must have the leader yarn wound on in a specific way (see above) so it doesn't slip off the spindle when snapped/rotated around. Other variations of shape for Scottish Dealgans/Farsadh/Fairsaids do exist, but most need the typical 'Dealgan' wind-on to work as stable spindles. The precise meaning of the Gaelic "spindle" words is not known. These names may refer to both whorl-less spindles and spindles with removable whorls. Both whorled and whorl-less spindles are found in collections in Scotland and in North America's northern East Coast. If they are sold, please contact me THRU ETSY MESSAGES to get on the order list. I ship to assorted countries - just ask me. My research is ongoing and I am always glad to hear of further information or surviving examples of these fascinating and sturdy whorl-less spindles. Glasgow Museums Resource Center, Scotland; Royal Ontario Museum, Toronto Canada; Gaelic College Museum, Cape Breton, Nova Scotia, Canada; Dr. Wayne Harbert, Cornell University, Ithaca, NY. Sincere thanks also to Ravelry forum group members of 'Spindle Lore' for their helpful discussions of whorl-less spindles, especially those who shared family memories of these spindles online and thru personal communications. Many modern spinners pride themselves on very finely spun singles. However, our ancestral spinsters had to spin varying sizes of yarn, depending on use and type of fleece they had access to. The dealgans/farsadhs last remembered usage includes knitting yarns, rug wefts and plied net twines. Many of these are what we would consider medium weight singles yarns. The Dealgan beah (little spindle) of Mary Red Dan Smith is a plying spindle and quite short. The spinster will be able to fit 2-3 ounces of plied yarn on this short spindle, but the actual yarn ball will be grasped for the last half of the flicking to make twist as the yarn ball gains in weight and circumference. This little spindle is fun for plying (it fits in my pocket…….) but not my favorite for singles spinning. That is not the case for the two types of spindles that the Burnham's collected on Cape Breton and Prince Edward Island, Canada. These spindles are far more elongated and are useful for both plying knitting yarns and for spinning singles yarns of wool. There is one clear picture from the late 1890's taken in South Uist, Outer Hebrides where the spinster is clearly spinning on this elongated type from carded wool rolags. When you choose to revive spinning on these sturdy spindles, you walk in the footsteps of determined Scots women who led lives of sturdy independence, often on very remote islands and coastlines, whether in the Outer Hebrides or the remote coastlines of fishing communities in Canada. I've wanted to share the type of long draw wool spinning I learned from famed spinster Edna Blackburn long ago (1970) in Ontario, Canada at her Albion Hills Farm School. More about her here. Few now do the type of English long draw I learned there. While I have taught this technique many times in person, I wanted to try sharing this over the internet without being able to touch your hands as you tried it out. It often utilizes shorter wools, rather than the longer wools suitable for wool combing. You'll find my video on Youtube "Carding Wool like a Ghost" as a companion video to "Spin like a Ghost"
Long Draw technique is either exactly like or similar to 'Double Drafting' and my terminology 'Half Yarn' and involves stretching wool fibers that have some twist inserted, but not enough to make finished, unstretchy yarn. At the 'half yarn' stage, the wool can be stretched farther to make the fiber thin out very quickly to the size desired. As the fibers thin out, the yarn becomes weaker, since the twist required to make a strong yarn is being 'used up' as the yarn becomes thinner. 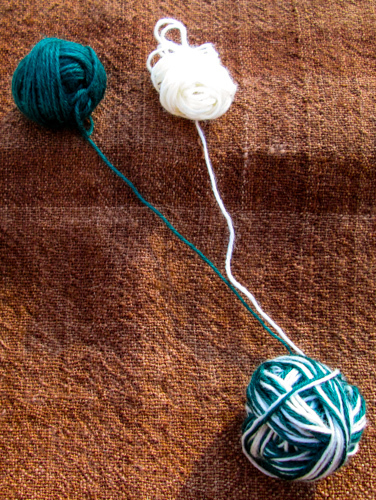 The major rule of more twist for thin yarn and less twist for thicker yarns is prime spinster science here. It takes practice to gain a feel for timing of twist entering the wool keeping the 'drafting' zone alive and unfinished for quite a long length - it could be 2-3 feet before it has 'finishing' twist entered into the extenuated draft zone to make a strong final yarn. 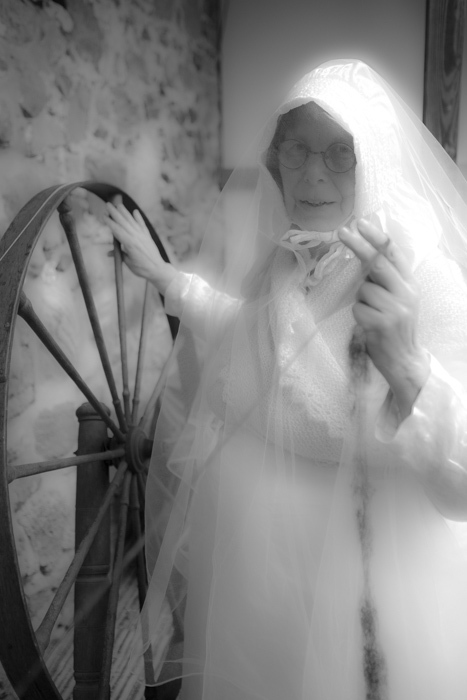 This technique is frequently seen in hand spindle spinning and wheel spinning videos around the world. 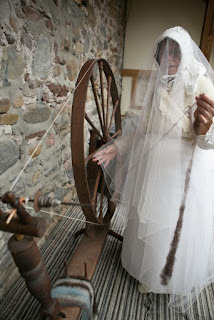 One that exhibits wool wheel (muckle) spinning can be seen here. 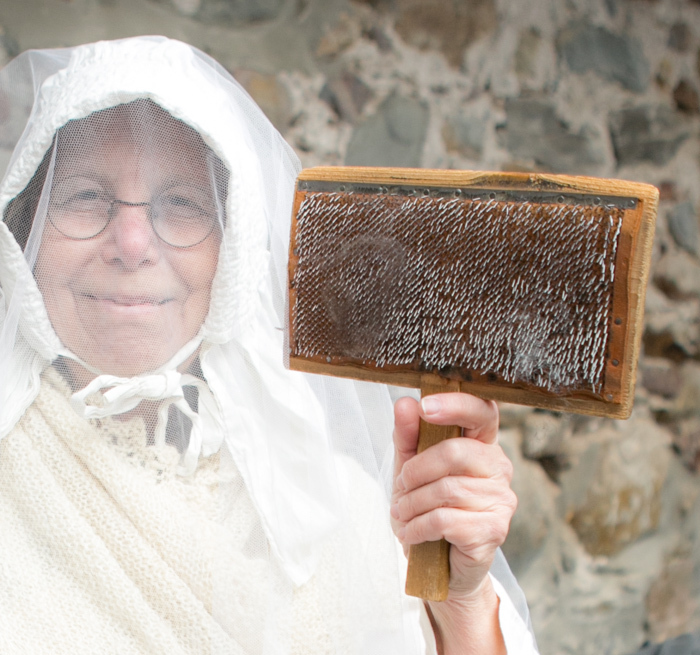 This is from Irish videographer David Shaw-smith and is part of a craft series of great importance to historical spinning. 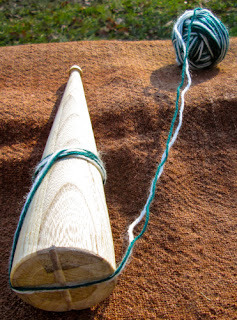 This particular segment shows an ancient technique on a primitive wool wheel with a wooden spindle in Ireland often called a muckle wheel. It surely must be a rare survival of the walking wheel techniques of the Middle Ages, such as is seen the Luttrell Psalter and Decretals manuscript illustrations. 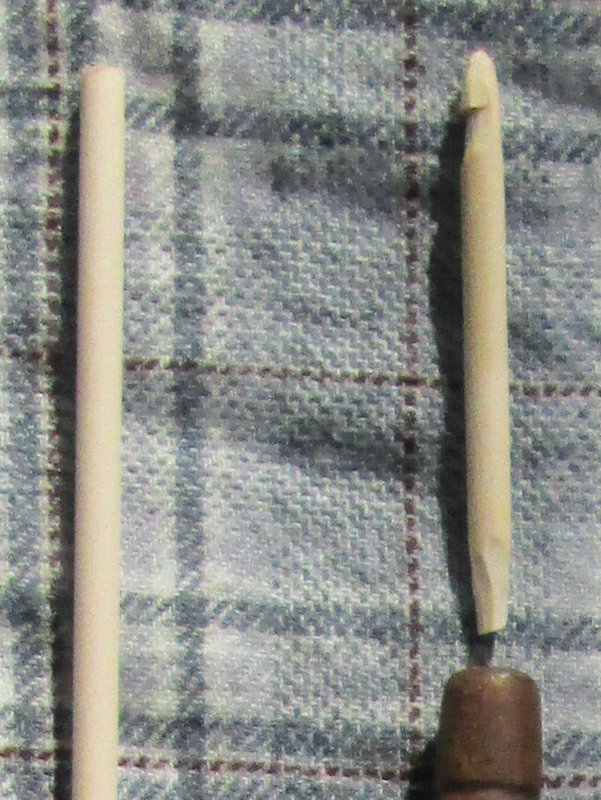 The long draw technique is not exclusive to carded rolls or rolags, but it is often used with them. It is very helpful if these rolls are light and fluffy, hence the companion videos of carding wool and long draw spinning. It is also very helpful if the wool fibers are shorter - 3.5 inches or shorter. 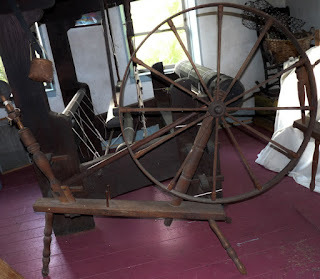 When long draw spinning is done on a treadle wheel the main difference between walking/great wheel and treadle wheel is the pace of twist delivery. On a treadle wheel, the twist delivery is fairly constant if the spinner continues to treadle. This means that controlling 'half yarn' typically needs two hands - one at the bottom near the orifice to open and shut the pinch 'gate' so that half yarn can be drawn out. When the lower hand pinch 'gate' is opened fully, the half yarn is finished and wound onto the bobbin. This takes well prepped fibers and consistent rhythm in treadling and hand coordination. Ruth Mcgregor is a genius at this HERE. In which I use an 1808 CE Great (or Walking) Wheel to spin wool into woolen style yarn. Ghostly Work in the Granger Pioneer House. The Granger family settled in Wayne County in 1812. Mr. Granger's first wife died at a young age around 1825, leaving small children behind. At that time, many pioneers were settling in areas half water/swamp and half drumlin hilly farm land. Mosquitos brought fevers, especially yellow fever to many. Mr. Granger remarried the next year and lived in this field stone house until he moved to Michigan in the 1840's. We purchased his house in the early 1980's. I don't particularly believe in ghosts. However, one night when I was sleeping in the old part of the house, near the oldest fireplace, I woke up screaming from a vivid dream. There was a woman in the shadowy part of the room dressed in a brown dress with a rather high waist. She was advancing towards me. She didn't want me there, hence the (real time) screaming. Once I was fully awake, I saw no more ghost. I never slept in that room again, however. A few years later, I encountered the 1808 wheel for sale in the same small town. It came from the Granger sisters, who were descendants of the same large pioneer family and never threw anything out. This 1808 wheel has characteristics of finely made wheels coming from Pennsylvania, especially the developed areas near Philadelphia, PA. The Grangers migrated from New England thru Phelps NY. But it is hard to say if other pioneers married into the family and the wheel came with them, or it was purchased from someone with PA connections in the area.